Articles - Rosy Aronson, Ph.D.
July, 2011: (BODY) "Sweet Vessel BodyMine"
September, 2011: (Signif. OTHER) Blossoming with (or without!) a Partner's Support! October, 2011: (SUCCESS) What's Success Anyway? 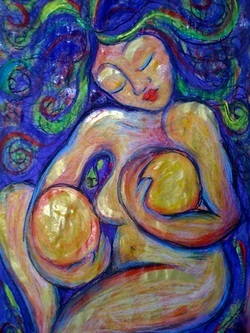 November, 2011: (SPIRIT) Motherhood & the Spiritual Path: a match made in heaven, or an oxymoron? Grandma Jewel, Mundane & Magic! My daughter was named after my father’s mother, Grandma Jewel. Like most Jewish grandmas, she had her form of “mischigas” (idiosynchrasies). Sometimes her standards were a bit too high, and she had trouble appreciating the musical taste of us crazy young kids. But she had many many gifts. One in particular always struck me. Grandma Jewel had a way of finding magic in the mundane. Whether she was sculpting a rose out of an orange peel, turning a few packets of Jell-O into a rainbow masterpiece, or transforming the inside of a toilet paper roll into an extension chord holder, she was making something extraordinary out of something ordinary. And she was having fun. I don’t highlight Grandma Jewel’s gift as a means of promoting domestic perfectionism. I’m not suggesting we start flitting about our kitchens like mini-Marthas, or whistling joyfully while scrubbing toilets in butterfly formations (although now that I think of it, that may be worth trying). What I am talking about is being open and willing to find beauty and magic in the most unlikely places. I’m talking about having some more fun, being a little more like our kids, bringing a sense of play and adventure into our lives – even when we’re doing something that under most circumstances would be deemed unimportant, unimpressive and dreadfully boring. At an even deeper level, I’m talking about learning to see ourselves – and all that we do as mothers – differently, and in a more positive light. I want us to look beneath the seemingly endless mundane surface of our lives and find the magic. Lord knows, in this productivity/success-oriented Western world of ours, so much of “mother’s work” is invisible. If we’re not making money doing it, if we’re not earning an award for it, if our resumes aren’t enhanced by it, then “IT” – whatever it is -- doesn’t count. One thing is for it not to ‘count’ in the eyes of society. That’s painful & obvious enough, and tragic on so many levels I won’t even get into it here. But it’s a whole other thing when it doesn’t count in our own eyes, when we find ourselves looking at our own lives, and not seeing any of the fullness, or the beauty, or the richness, or the accomplishment, or the deep and utter importance. So many of the moms I work with -- even those who full-heartedly chose to let go of their “careers” and embrace their roles as mothers from a deeply empowered place, even those who LOVE being moms and are in highly respectful and mutual relationships -- still struggle with feelings of invisibility and unworthiness. They still look at what they’re doing and have trouble seeing and FEELING the value. They’re seeing the orange peels of their lives as orange peels, not as glorious roses-in-bloom, or about-to-bloom. The body. Such a simple word… and yet, how many of us women growing up in this culture make it through adolescence with a simple and healthy relationship to our bodies? How many of us feel comfortable in our skin, happy with our shape, and full of radiant energy? As I was contemplating the theme of this newsletter, I flashed back on a self-revelatory performance I did over 10 years ago, as a part of my training as a Drama Therapist. In the profoundly vulnerable piece, I explored the wound, the evolution and the ongoing healing path my body and I have “walked” together. At one point, I held a soft and large doll in my arms and gently rocked her to “BodyMine” by Lori B. "I'm a veteran of this endless siege against myself. Don't know how this war got started. I just fought like hell. Sweet vessel BodyMine... Won't you be my home? We've been separated too long..."
It was a powerful moment, to welcome my own body back into my life with gentle eyes and loving arms, while being witnessed by an audience that was there to support, not judge. That experience marked a turning point for me. At some deep level, I was able to put to rest an ancient and painful pattern of self-objectification. A seed of self-love was planted. Ever since that evening, I’ve been learning to accept & appreciate my body as the sacred and essential vessel for my life, as the source of so much creativity and joy, and as that which connects me to all that lives and breathes on this beautiful earth. The next time I rocked a body in my arms with that kind of love, awe and humility was at the birth of my daughter Maya Jewel. As I looked into her eyes and massaged each of her little toes, I felt such a fierce and tender protectiveness towards that tiny body of hers. Like a Mamma Bear, I so wanted to shield her from having to go through the pain of ever feeling separate from her beautiful body, of being the object of our society’s distorted ideals, of feeling unhealthfully judged or measured in any way. Of course, I knew that I could never totally protect her from the world and its influences. I could certainly make choices when she was little about how much TV she watched or who our family spent time with. But ultimately, I’d have to surrender – like all parents must – to the wonderful (sometimes frightening) reality that my daughter would have her own human life, full of joys and blessings, challenges and pain. Of course, my main job was to love her through it all… and to love and cherish that miraculous body of hers, no matter how she felt about it as she made her way towards womanhood. But that wasn’t my only job. My other job, perhaps an even more important – and difficult -- one, was to love and enjoy my own body. It was no longer just about me and my little self-acceptance project. It was about Maya. I needed to model for her what it was to be a fully embodied woman – alive, present and at ease in my own form. I am committed to this process of self-love and embodiment, and I invite you to join me. May we look in the mirror and love what we see – wrinkles, cellulite and imperfections and all. May we embrace our inner and outer beauty for the sake of our children, and realize that when we look into our own eyes with love, we are admiring the diversity and perfection of Nature Herself. Sometimes I look at my daughter when she comes home from school, and it feels like she’s grown 2 inches since she walked out the door that same morning. During moments like these, I can’t help but feel a double & paradoxical pang: 1) The pang of realization that my self-time for the day is over, and I have to move into playdate-hosting, snack-making, child-serving mode, and 2) the pang of realization that my baby is growing up at lightning speed, and my time with her is increasingly fleeting and precious. Over the years I’ve learned one thing. And that is that when these two ‘pangs’ mate, they tend to produce guilt-ridden offspring. ... and yet I miss myself desperately. ... and yet I don’t want to miss out on a single moment of my child’s life. ... but I don’t always feel quite so respected. but I can't quite trust anyone else to do it right. ... but I’m drowning in a cascade of relational obligations. I’ve chosen with all of my heart this wonderful, glorious blessing called "motherhood"
... but I seem to be turning into an out-of-control, screaming, grunting, irritable & resentful monster! It's like we forget to breathe. We run around, multi-tasking like Tasmanian Devils, living nose-deep in calendars and head-high in worries. We're everywhere but the present. Our happiness, if not irrelevant, isn't important enough to get "scheduled in." And 'Mindfulness'... well, that's just some lovely, distant, unreachable concept that we read something about, back-in-the-day. When was the last time someone asked you, "Hey, how are you doing? Are you happy? Is there something -- or someone -- you need?" When was the last time you took a moment and just paid attention... to what was going on inside of you? Or, towhat was going on all around you -- without re-acting, or rushing to fix, or save, or serve? When was the last time someone put a hand on your heart, and another on your back, and gave you permission to give out a sigh... or to have a good (& well-deserved) cry?! How to Blossom with (or without!) our Partner's Blessing! When the TV show “Thirty Something” came out, I was living in Europe. So I missed it entirely. But recently, a friend of mine gave me the DVD set to the show’s first season, and I started to watch it. Wow. Whether you’re a fan of the show or not, they really nailed some of the issues that can come up for a (white, middle class, heterosexual!) couple once kids enter the picture! I certainly could relate to many of the themes addressed in this T.V. drama, and I recognize many of the themes in my clients’ lives as well. How often we partners feel like ships passing in the night, constantly taking shifts, bartering free time for responsibilities! I remember some good friends of mine, the parents of twins, who used to fight over who got to clean the bathroom! For a while there, scrubbing the toilet was much more desirable than having to be with the kids. And how many of us feel like as much as we love our partners, at some level, they just don’t get an essential aspect of our experience. Or, for whatever reason, they just can’t seem to see and appreciate all that we do -- for them, for our kids, for our family. Or, they don’t fully appreciate all that we’ve sacrificed, let go of or put on hold, in order to show up so fully for the family. A lot of the time, we don’t even want things to be that different than how they are. We’re glad about our choices, and know that the love we feel for our kids and family far outweighs any sacrifices we may have made. But when each partner of a parenting couple is feeling drained, overworked and/or underappreciated, “thank you’s” and “How can I help’s?” can be hard to come by. And when there’s an emotional or energetic deficit in the family, we can have people crawling all over us, and still feel a deep loneliness. An invisibility. A painful sense of hopelessness. Creating the space for true Personal Blossoming becomes even harder during these times of strife. When survival takes over in a relationship, mutual support, enthusiasm and co-creativity get thrown to the side of the curb. When someone’s really on their “blossoming edge,” they need A LOT of support. This is because blossoming takes courage. A huge amount of courage. It requires a willingness to do something we haven’t done before (or in a long while), a willingness to take a risk, to believe in ourselves, to take our longlost dreams and longings seriously. When we’re on the verge of blossoming, we’re usually breaking through old, paralyzing fears. And when we’re moms, one of our biggest fears is that somehow our own blossoming will diminish or hurt our relationships, relationships which we cherish so deeply. So more than ever, we need to know that our partners are with us. It’s not enough for them to be not against us. We need them to have our backs, to believe in us even when we don’t believe in ourselves. We need to know that our relationships can be resilient & thrive in the face of change… in the face of our changing, of our becoming even more of who we are… even if it takes some time (often more time than feels comfortable!) for our paths of purpose to become clear. We need to know that if we let go a little, that our partners will step up and hold some of the responsibilities that we’ve been carrying up until now, so that we can spread our wings and not worry about the nest tumbling & crashing to the ground when we do. But to do that, to provide us with that kind of support, our partners need to feel supported too. They need to feel acknowledged and appreciated for their devotion and contribution. They need to be respected for who they are, for doing things their way, even if their way may be different from our own. They also need the kind of surplus that thrives outside of survival fear/self-defense territory. And they need to feel prioritized. We’re not the only ones who have the fear that our blossoming might wipe out our relationships. There is no easy answer here. Relationships, like parenting, like blossoming, are practices in their own right. And sometimes we have to choose our own blossoming, without our partner’s blessing… or without a partner at all! That said, I invite you to begin a little relational exploration, to see how you and your partner are doing, and perhaps to see what areas of your relationship are most in need of care and attention. If you could use a resource, I invite you to contact me too. I’ve worked with many couples over the years, and also know of wonderful counselors who do the same. My service/career path has been more like a zigzag than a straight line. I’ve bounced like a slow-motion pinball from traditional to nontraditional learning environments, carefully gathering what I’ve needed to provide a service that resonated with my deepest values and personal style. Before conceiving my daughter Maya, I had come to a relatively comfortable resting place along this journey towards service-self discovery. I had established a therapeutic orientation (based on transpersonal psychotherapy and the arts) and way of working that felt good to me. I enjoyed working with clients and found ways to express my authentic creativity-loving self within a therapeutic context and identity. It was a strange thing, to suddenly experience my own joy and creativity as maternal imperatives. I was used to perceiving the mother-job as a sacred act of self-sacrifice. But somehow, for me, becoming a mother meant solidifying, protecting and expressing my-self and Self. I owed it to my daughter, who would need me to model self-love and self-expression for her. I owed it to my own inner child, who as modeled by my own mother, had been sacrificed time and time again for the needs of others. Suddenly safety, space and simplicity were all that mattered. I found myself making significant changes in my life. I catalyzed a physical move for me and my husband Kim, insisting that our new home include ‘a room of my own’. Instead of accepting tempting career-oriented offers, I enrolled myself in meditation, birth preparation and prenatal yoga classes. I simplified my social life, letting go of friendships that felt less equal. And finally, unlike other pregnant colleagues who took temporary leave from their budding therapy practices, I gave final notice at work and terminated with all of my clients. I had no idea what would happen to me after having a baby, but I knew it would be big. After having Maya, the last place I wanted to be was back in the therapist seat. (I didn’t even want to be a client! I ended a long-term therapy relationship just a few months after giving birth.) My needs for care-taking were more than fulfilled, and I liked the feeling of a fluid life, where my psyche and heart could safely open and merge, without having to continually hold, track and manage the psyches of others. Dealing with my own psyche was MORE than enough. By the time Maya was a year old, I began to feel creative tickles -- the call to write, to dabble in my unconscious, and see what would emerge. It took time to heed this particular call. There were a plethora of practical, pressuring, professional voices to appease. Thankfully, with the help of my husband, I agreed to temporarily ignore the discouraging voices and pursue my creative dreams. Something big happened the moment I surrendered to writing for children -- something intricately connected to my service identity. Though I didn’t realize it until much later (several years and two more academic degrees later, in fact! ), I believe it was at that point that my ‘identities’ as a spiritual counselor & creativity coach were conceived. Let’s just say that my professional unfoldment – post-momhood – has been a long and windy journey! Fraught with worries, anxieties and seemingly crazy decisions. Many moms come to me because they feel ready to blossom professionally. Whether their youngest is about start kindergarten, their family seriously needs the extra income, they’re going stir crazy in their current work environment, or they’re just bursting with creative energy, these moms feel an inner rumbling and an outer opening for their re-emergence into the “working world” - and/or a reinvention of their working identity. For the majority of these wonderful women, like it was for me, this can be an enormously exciting, fertile and sometimes scary time. Can you recognize yourself in any of these statements? So many moms feel that something new is wanting to happen. But they don’t know yet what that new direction is, or where to start. Perhaps you find yourself in an uninspiring job that doesn’t really reflect who you’ve become or allow you to fully blossom. Perhaps you’ve chosen practicality over passion, and now you feel like you’re squelching your creative dreams to a point of practical non-existence. Maybe you’re lucky enough to actually know what you want to do, but you just don’t have the confidence to go for it. Maybe you just need help rediscovering your strength, your voice, your courage. Perhaps, for you, it’s just about finally releasing yourself from habitual negative self-comparison &/or eternal-guilt traps. Or maybe you’re like many of the moms I tend to work with. You’re a multi-talented and versatile type (the Mom job seems to require that!). And as wonderful as those qualities are, (they make for fabulous mompreneurs! ), you feel like you’ve dabbled in so many things that you have no single profession or place to call home, or to claim an expertise. The fact that we live in a society that (still!) barely recognizes motherhood as a form of work, where anything that doesn’t bring in income is not considered of value, only exacerbates matters. Perhaps that’s why one of the things that I enjoy most is teaching moms how to see and talk about what they ALREADY do in a way that feels empowering and valuable. Whether you need more courage, confidence or clarity, you deserve some support! Click here to ask for your FREE GIFT -- a self-exploratory worksheet designed to help you begin your professional blossoming process by locating your biggest challenges. Please don’t hesitate to reach out to me if you think I might be able to help you in any way! I’ve got lots of resources, and it would be an honor and a pleasure. Motherhood & the Spiritual Path -- a match made in heaven, or an oxymoron? One: My true mission is probably something extremely simple, and easily applicable to countless situations. Two: My mission is not equal to my job description... (though it's important that I feel deeply connected to my mission, no matter what I’m doing on the surface). Three: My mission must somehow involve my deepest wound and all I’ve learned from working with and through it. Four: My mission must come naturally to me. It has to involve something I can’t even help but do… something I do in my sleep, when I’m sick, when I’m not in the mood. Five: My mission must require that I take risks. It must stretch me in some way, make me willing to break through my fears. Six: My mission isn’t really about me at all. It’s about getting 'out of my way' and being of service.